This weekend three of us from our riding club, along with a few others, will embark on a four-day motorcycle camping trip to Utah and back. Heading across the California desert, through Nevada, and camping in Zion NP, and Natural Bridges NM. Then come home through the Grand Canyon, and hit up Grand Canyon Caverns. So I'm going to see if I can document this trip on Twitter. A couple of months ago my buddy Brian said he wanted to get an iPhone because he wanted to document his cross-country motorcycle camping trip from California to Maine and back. He got his iPhone, but I never heard if he tried posting stuff to the web with it. Like me, Brian likes to write about his experiences on the bike. Except he doesn't have a blog. He posts his stuff on whatever biker-forum-flavor-of-the-month he's eating. 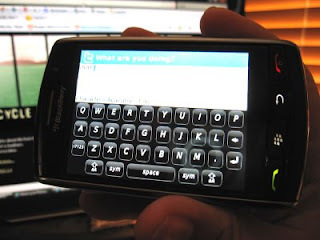 So that inspired me to get a Blackberry Storm (Verizon Wireless doesn't support iPhone). Right out of the box I tried to post updates to our riding club site, using the Blackberry's native web browser. It's not very convenient to say the least, and I'm a computer-geeky type of guy who has patience for this stuff. Brian, who doesn't have patience, may end up chucking his iPhone into a lake after fussing with a URL. So it seems like Twitter may be easier to do considering each entry is just 140 characters max; it lends itself to keeping thoughts concise. I installed the Twitterberry app on my device, which seems more elegant than going through the Blackberry web browser. I also set up "Twitpic", a photo-sharing site dedicated to Twitter. It let's me compose an e-mail in Blackberry, attach a photo, and upload it to Twitpic. Twitpic then posts a corresponding "tweet" on my Twitter account. So basically, I have a much easier way to post updates about my camping trip. If it works out, I'll see if I can get Brian on it. Other worthy mentions, is that Blackberry also has a Facebook app that makes it easier to connect to your Facebook account, and it too has a photo-uploader. I thought of documenting my trip through Facebook only because I have more friends who follow me there, but it seems that I have more motorcycle bloggers following me on Twitter. Interestingly, Facebook has an app that will pull my Twitterfeed and publish it as status updates. But for whatever reason, it doesn't consistently work. The Blackberry also has an app for Flickr, another photo-sharing site. I do have a Flickr account, but I'll try Twitpic instead, only because it's tied in with Twitter. But I'll also bring my digital camera, and take gobs of pics with it. And I have to remember my car charger; the Electra Glide has a DC port to keep the Blackberry juiced up.